If you’ve been following this site, you already know I’m a big fan of the Doodlebugged Mysteries and its award-winning author, Susan J. Kroupa. Doodlebugged is that rare sort of series that appeals to people of all ages and is truly a delight to read over and over. Shadow, with his keen intelligence, his independence, his often maniacal energy, and his always amiable spirit, was truly the most interesting dog I’ve ever had. Admittedly, sometimes he was interesting in the Chinese curse sort of way. He was a study in contradictions. He liked everyone, but was not especially affectionate with us, at least not until the last couple of years. He was a dog who liked his space. He loved treats, but often would not work for food, and would thoroughly sniff anything we offered him, because, hey, THIS time it just might be poison. He was loyalty impaired—a go-where-the-action-is kind of dog—and not averse to abandoning me during a walk if it started to rain, and race to the shelter of the porch. A true country dog, he was equally at home in the city, attending soccer games and events with my grandkids. His antics taught me how little I knew about dogs and sent me in search of more knowledge. He learned early on to hold still if I was holding a camera. After all, as I used to joke, he had “his public”, the many people from neighbors and friends to field workers and service people that he befriended. More than once I had the occasion to meet someone for the first time only to discover they already knew Shadow. “He has more friends than we do,” I would complain to my husband. And it was true. Shadow inspired a host of nicknames: Motormouth, the Barkster, Boing-Boing, The Ever-Ready Labradoodle, Jumping Jack, Bear-Bane, and Possum-Bane. Oh, how he loved to catch possums! I often said finding them was his super power. He inspired a book series. The Doodlebugged Mysteries came directly from observing Shadow, who would stare up at me, never breaking eye-contact, with an expression that clearly said, “Seriously?” He was his own dog, not a people-pleaser, even though he was always pleased to be around people. 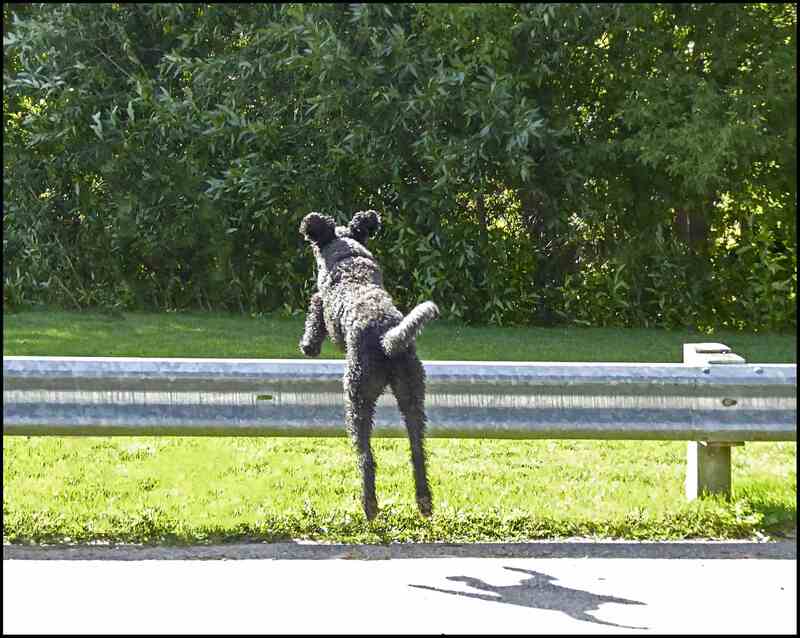 Doodle’s oft repeated mantra that “smart and obedient don’t go hand in hand” came straight from Shadow’s actions. Fly away, home, Shadow. May you find woods to race through, logs to leap over, possums to catch, and bears to chase away, and may you live on, at least in part, in Doodle. You’ll find the complete post with more photos and links to previous posts at Fly Away Home. Shadow will live on in our hearts and in the Doodle stories, and I am grateful to Sue for allowing us to be part of Shadow’s public. This entry was posted in Authors You Might Like, Dogs, Home page, Writing and tagged dog training, Doodlebugged mysteries, Shadow, Susan J. Kroupa. Bookmark the permalink. Thanks for sharing that, Susan. Sue, I’m so sorry for your loss. They take part of our hearts when they leave us. It’s been almost 19 years since I lost my spaniel Alix yet sometimes it seems like yesterday. She’s the spirit of Sweet Pea in my series just as Shadow is for Doodle. Wherever Alix and Shadow are, I like to think they’re happy. Oh what a face! Thank you for sharing him with us. He sounds amazing…I’m sorry he had to move on to his next adventure. I’m sure his family will be very lonely without him. I’ve had it happen too, that I walk into an event with Katie and people run to meet her, people I’ve never met before. It’s a weird sensation. Hugs to Shadow’s Mom.